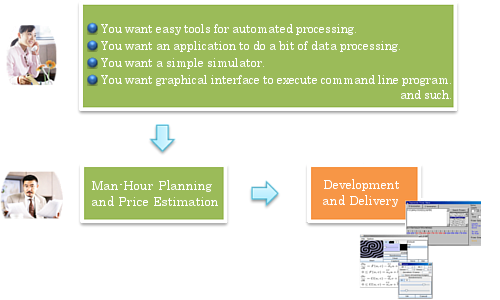 This is a service to develop simplified software application at a low price for such as numerical analysis and statistical processing. Price is a minimum of 8,000 USD. We estimate price depending on level of difficulty. [Language] C/C++, Java, C#, MATLAB, LabVIEW, Flash, etc. Please use telephone, fax, email or web form for questions and consultations about "Simplified Tool Development Service".